Paving from Andy and his team is a great way to positively transform the look and feel of your garden, drive or business. Whether your garden needs renovating or your drive needs a complete remodel, paving is an excellent way to achieve this. From rectangular, shaped and permeable block paving, the choices are endless. Andy and his team at Staffordshire Brickies have over 30 years experience that allows them to boast first-rate laying of all types of paving. Finding a builder with the ability to lay paving smoothly with an excellent finish is difficult, especially when you have to account for the extortionate prices charged by many who offer paving in Staffordshire. This is why Andy is so keen to maintain his excellent reputation as a grafter, working hard with precision and a close eye for detail so that you as a customer know that you’re getting your money’s worth. Throughout his career providing paving in Staffordshire, Andy has worked on plenty of garden paths, driveways, back gardens, small business driveways and car parks. If you’d like to benefit from this professional paving talent, you can call him for a quote on the job you have in mind or to ask any general queries. 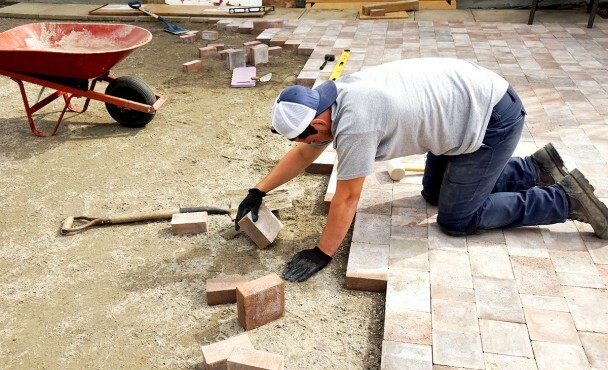 Proper paving has the ability to completely transform the impression your home or business gives visitors; smart, well-laid paving is much more impressive than unkempt grass or dull, uneven concrete. If you fancy a paving makeover, Andy is more than happy to be the man for the job. Not only will you be happy with the outstanding job he does, you will also be sure that you’ve had excellent value for money with his high quality services and fair prices. If you have any queries or would like to discuss a quote, contact Andy here and find out what he can do for you today. If you’re in need of some paving work in Staffordshire, Andy and his team are perfect for the job. As you can see from the map above, they’re situated in Silverdale which is the ideal location for travelling to anywhere in Staffordshire. Whether your paving needs are in Stafford, Newcastle-under-Lyme, Hanley or anywhere inbetween, Andy and his team are happy to travel to you. Give them a call for your paving needs in Staffordshire today. My name is Andy Raeburn and this is my website. My team and I specialise in providing bricklaying, paving, roofing, fencing, groundworking and building maintenance to the Staffordshire area. From my roots at the Cauldon College of Building, I've been working for more than thirty years - that's more than three decades of experience that you can trust in. As a local man with a good feel for the area, there's simply no substitute for that level of hard-earned expertise.